February 4, 2016 — The celebration continued this past Thursday at Galena Park ISD Football Stadium for the North Shore Mustangs football team after claiming the Class 6A, Division I championship with OT win over Austin Westlake. It was the December 19, 2015 state championship final at NRG Stadium the Galena Park North Shore Mustangs (East Side) (13-3) beat the Austin Westlake Chaparrals (14-2) 2114 in overtime to win the Class 6A Division I championship. Thursday before a packed home team bleacher of fans, family and elected officials the Mustang football team wearing shirts claiming ownership of not just the school or city but rather the state received volumes of praise. HIGHLANDS – The San Jacinto River Coalition, and the Galveston Bay Foundation, held a joint meeting last Tuesday night, to hear details of the State’s plans to use the settlement money from the lawsuit against the companies that created the Toxic Waste Pits in the river. 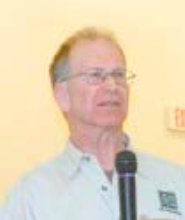 Representative from the Texas Parks and Wildlife Department, Ted Hollingsworth and Jim Murphy, reviewed the history of the Waste Pits, and then discussed how the state’s share of the settlement, $10 million, could be used. They explained that the state legislature, through bills sponsored by Representative Wayne Smith and Sylvester Turner, had insured the money would come back to the communities around the river. However, the state stipulated that these funds could not be used to remove the toxic materials, or to compensate individuals for health or other damages. AL REESE, Houston Rodeo speaker at the North Channel Chamber luncheon. The North Channel Chamber was informed about the Houston Livestock Show & Rodeo at their monthly luncheon, last Friday, Feb. 5th. 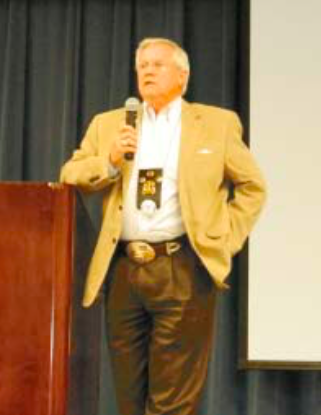 The speaker from the Rodeo was Al Reese. Reese is a financial advisor with Integrity Growth Group, and a director of Integrity Bank. He has been associated with the Houston Rodeo, its new name, since 1986. Reese spoke about the history of the Rodeo, economic impact that the Rodeo has on Houston, and the scholarship program for youth. a 4 year period. To qualify, you must be attending a Texas High School, and plan to go to a Texas college or university, or community college. Applications for next year’s scholarships are due Feb. 8th, and Reese urged every student to apply. The Rodeo has 100 full time employees, and over 32,000 volunteers that work to make the Rodeo a yearly success. The Houston Rodeo is made up of many different activities, Reese said. These include 13 trail rides, of which the first was in the 1950s. Also, there is a World Champion BBQ competition for 3 days, starting Feb. 26. The public is welcome. The Rodeo will start March 1st, and continue through March 20. Each night there is a livestock show, rodeo events, and world class entertainment. Popular entertainers this year include Miranda Lamber, Pitbull, and Keith Urban on the last night.